REVERENCEMEDIA.COM » Archive » Worship. Life is constant worship. Not an event. As a created thing there are certain characteristics that are just a part of who and what I am. I am flawed. I am fragile. I am a worshiper. You are a worshiper. Everyone worships. The only thing that separates one worshiper from another is the object of their worship. I find this truth to be a great perspective to come from when living life and making decisions. Even the smallest, most minuscule tasks or choices are acts of worship. I often find that my choices and actions and thoughts are acts of worship towards myself. My body. My preferences and tastes and desires. I often worship material things like cameras, computers, and shiny fancy objects. Now I may not bow down per se to any of these things, I don’t verbally proclaim “I worship me, I praise me.” But my actions reveal that at the core. It is quite a sad way of life really. To worship myself. To worship and be consumed with material things that do not last. To worship objects that have been created by such a flawed race of beings. To then realize that the creators are in and of themselves created beings. 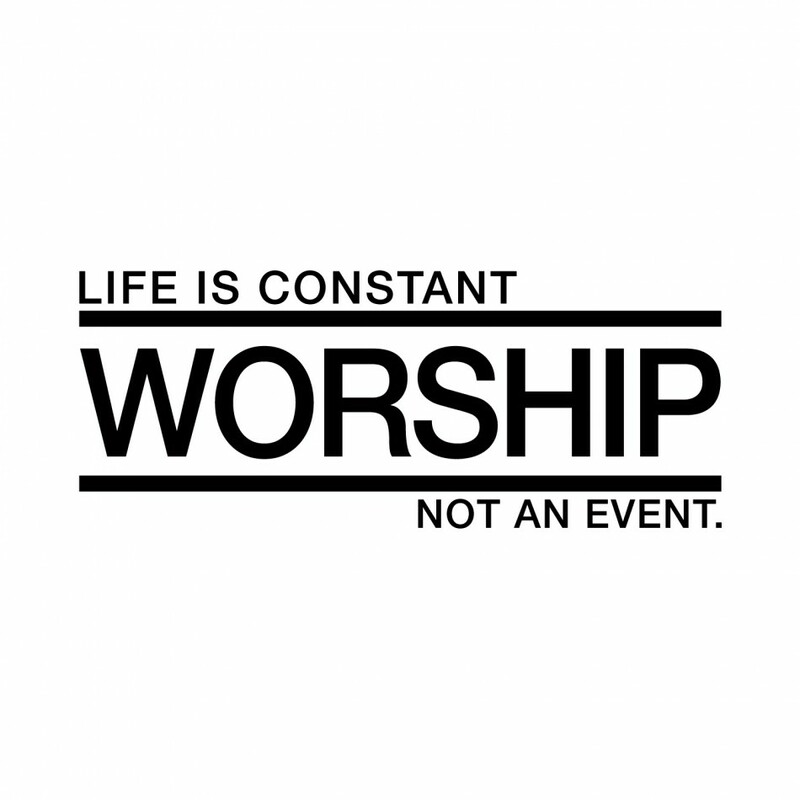 I have this simple design with the afore mentioned statement: “Life is constant worship not an event” as my computer and iPod touch background as a reminder. A reminder that my life, my life as a whole, my life consisting of every thought, choice, and action I make reveals a choice. A choice of what I have decided to worship and consume myself with. Am I about to worship my Creator or something that was created? Am I about to really expend my limited time and energy worshipping something so silly as a piece of technology? Am I seriously willingly going to worship and satisfy my own ridiculous wants and desires? Or am I going to worship the God of the universe. Will I choose to fill my mind with thankfulness and praise and constantly worship the Savior and Redeemer of my soul. Everything is worship of something. Even the smallest things worship something, someone. Unfortunately I often find myself worshipping meaningless and shallow things. Namely myself, in some manner or another. But fortunately my God and Creator is full of grace and mercy. Fortunately life is not fair. Fortunately His grace is endless. Fortunately He wants to help me worship him. Fortunately I do not have to face judgement for my failures of proper worship. He took my place on the cross. All the more reason it is just plain silly to worship anyone or anything but Him. I am humbled by the grace and love of Christ. Every moment is another chance to to worship correctly and live as doulos. 06/24/2011 | Filed under Thoughts. Great thoughts. I think sometimes it is too easy for us to give lip service to God without ever really taking the time to stop and realize what we really worship. Your graphic poignantly portrays this idea. Worship cannot be a point on the line; worship must be the line.